Hello! St Louis Style Blog has moved! If you are seeing this, it means you are viewing our old blog. 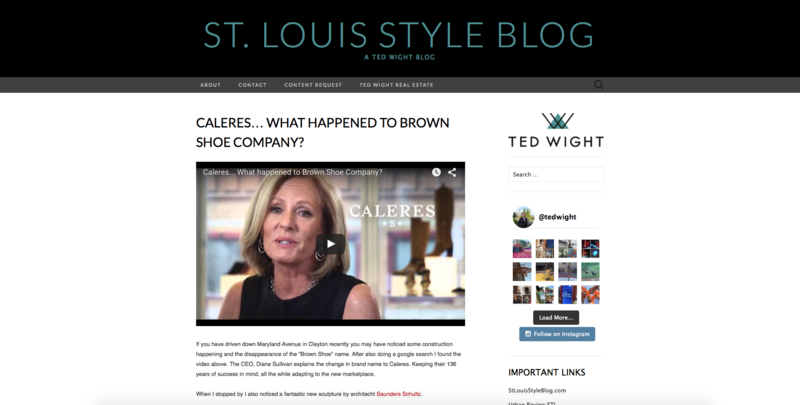 Please navigate your browser to www.stlouis.style and add it to your bookmarks. Same blog, same posts, new look! Hello! St Louis Style has moved! If you are seeing this, it means you are viewing our (old) old blog. Please navigate your browser to www.stlouis.style and add it to your bookmarks. Same blog, same posts, new look! Don't forget to add it to your bookmarks! Click HERE to view the new blog. A Ladue home that I sold last year designed by Daniel Gale is going through a major transformation. The kitchen and carport have been removed and a tasteful additional is rising. A well-known contemporary architect is doing the renovation/addition and I am certain it will be stunning. I know purist may cringe at such a big transformation, though this will save the house and will make it better! The alternative could be that it was torn down for it's large Ladue lot. Located in the up and coming SOHA neighborhood @4611 Macklind Ave is the new restaurant- Copper Pig. The atmosphere is cool and it was bustling on a Saturday night. I went to dinner with a friend before a house party. We started with the Crispy Brussel Sprouts with Miso and Bacon which was served warm and a delight. For the main course, my dinner guest has the Braised Short Rib, which took a while to come out, though was very tasty. I had the Bulgogi Cheesesteak sandwich. I have never met a cheesesteak sandwich that I did not like, though this one was a little heavy on the bread and uneventful. It came with tater tots which were basically tater tots with catsup...I guess I have been spoiled by the variety of french fries served in restaurants across town. (I am still thinking about the yummy Truffle Parmesan French Fries I had at Basso a couple nights before!) We were too full for dessert, though the table next to us looked like they were enjoying some delicious desserts. When in the neighborhood, check out artist Julie Malone's SOHA Studio and Gallery. Also nearby are two other yummy restaurants: Russell's and Grapeseed. Some St. Louisans say that the Lettuce Leaf was a brilliant idea, but just ahead of its time. Founded in 1976 in Clayton, the Lettuce Leaf was the creation of SLU professor William Saigh and his wife, Christine. Salads as entrees was a new idea to St. Louis, but the business worked and they opened three more St. Louis area stores and one in Kansas City. In 1991, the Saighs sold the business to some employees. Before the Parkmoor closed for good in 1999, regulars and some newcomers descended on the Clayton Road and Big Bend Boulevard landmark one last time. They dined on Kingburgers and onion rings and dreamed of the day the restaurant might be rejuvenated, as owner Lou Ellen McGinley talked about. Alas, it didn't happen. And now, the site of the old Parkmoor is just another Walgreens. I represented the seller of this charming home in U-City and I am happy to say that we have closed! I represented the seller of this charming and updated home in Richmond Heights and I am happy to say that we have closed! "No I should thank you! I am glad I was able to find you and you found the right people to do the jobs and saved me a lot of money! If I ever come to STL I will definitely meet you! Thanks for everything and do use me as a reference." Look at what I woke up to this morning! A gorgeous blanket of Japanese maple leaves. It is as if it was showered with rose pedals! Thinking About Buying or Selling a Home/Condo in 2016? Now is the right time to talk to Ted! I represented the buyer of the charming newer home and I am happy to say that we have closed! The Only Privately Owned Bunker Hits The Market for 17.5 Million! The only privately owned, government quality underground bunker in the United States just went on the market in Georgia for a nice $17.5 million. The bunker, which has been named "The Facility", is listed by Sister Hood at Harry Norman Realtors’ Buckhead office. The Facility is located beneath 45 feet of soil and rock in Tifton, Georgia. It's housed on more than 20 acres and the bunker is actually certified to withstand a 20,000 ton nuclear blast. The first level has a large home theater with seating for 15, a kitchen, recreation area, conference rooms, a decontamination shower and more. The lower level has four individual apartments. Each of the apartments has two bedrooms, one bathroom, a kitchen, dining area, living room, Internet with its own security, modern HVAC system and environmental monitoring sensors. The bunker was originally built in 1969 and was later renovated up to government standards in 2012. Friday night I attended a book signing for Jess Dugan, Author of Every breath we drew. It was hosted in a fabulous CWE mansion (sorry for the light streaks). "In the city’s Central West End, where more than a billion dollars is being invested by Washington University in St. Louis and BJC Healthcare, and the Cortex innovation district is adding companies and jobs at a fast pace, the Engineers’ Club of St. Louis can feel a bit dated. An overdue $3M re-branding and renovation seeks to change that." I think that some of these rendering definitely would match much of the new construction going on in the area. But I do think that some of the original designs should be included in the renovations as many of them are timeless. What do you guys think? Triangles were important to the original architect. Where are they now? I would be sad to see this go. Hopefully they can figure out a way to incorporate it. "AMERICA'S BEST SUBURBS FOR RAISING A FAMILY"
"Business Insider has released an updated list of the 50 best suburbs in America. The determining factors included housing affordability, crime rates, public-school ratings, and proximity to a city center – in this case, within 25 miles. In the end, the Midwest dominated the competition from the East and West coasts, but there are still plenty of options to choose from across the country, as evident by these Stepford-esque suburbs that make up the list's top 10." Lately I am seeing report after report rating St. Louis Suburbs as the best! Let's keep them coming! Plus I have a bunch of great homes for sale in Ladue! "Built in 1926, the most expensive home in the Show Me state forces you to look at it. Admire it. Soak it in. Once you’re done looking, you can ponder spending $10 million on this grand estate in Ladue, MO." This luxurious home was designed by renowned architect George Hellmuth. The listing agent, Sandra Coburn said that "the home’s original owner was a lumber baron who traveled all over Europe sourcing the best materials and artisans to give the home its distinct Old World flavor. Hellmuth worked with those raw material to create the manor now known as The Woodlands." What a wonderful home! It is a glorious Ladue Estate that is still intact with it's original grounds. It reminds me of a Central West End property with a gorgeous garden and pool! Where does Ted sell real estate? Check out this map of my current listings and sales since the beginning of 2015. What does this tell you? I pretty much focus on a large portion of St. Louis from Tower Grove to Chesterfield. This is just a short compilation of some of the videos we have captured thus far. We are still learning! I hope you like it! The Needy are getting Keurig capsules! I thought this was a bit humorous on a poster offering suggestions on what to give the needy for a food drive! As you probably saw in my post last week, Projects + Gallery had the opening event for Apex Predator which had never been in the United States before. The exhibit is available November 6 - December 23, 2015 @ 4733 McPherson Avenue in the CWE. Open Hours are Wednesday - Saturday, 11am - 5pm. Go see it! Edgy and cool! No real teeth were used...so don't worry! Caleres... What happened to Brown Shoe Company? If you have driven down Maryland Avenue in Clayton recently you may have noticed some construction happening and the disappearance of the "Brown Shoe" name. After also doing a google search I found the video above. The CEO, Diane Sullivan explains the change in brand name to Caleres. Keeping their 136 years of success in mind, all the while adapting to the new marketplace. When I stopped by I also noticed a fantastic new sculpture by architecht Saunders Schultz. Click here to read more about the rebranding! "Vacant for nearly two decades, the prominent corner of Clayton and Hanley Roads may finally be redeveloped. Planned is more than 500Ksf of retail, including a grocer, more than 40Ksf of office space, and as many as 291 residential units." I remember hearing of a proposal for something similar back in 2009. Unfortunately, nothing ever came of it. I think it would be a great way to fill the vacant site and bring new amenities to the area. From what I have been hearing this time around, I think that it will become a reality. Bad Realtor Photography- "Great Systems!" This new listing in Creve Coeur is really excited about their systems. All of these pictures come up before you can even see the Living Room and Kitchen. I guess this is equivalent to "Opening Your Kimono"! Charles Houska's Art was up and ready for the gala! I had a wonderful trip to Evansville for St. Louis Artist Charles Houska's special opening exhibit at The Evansville Museum of Arts History and Science. While I was there I stumbled upon this vintage greyhound station and I thought it was super cool! What do you guys think? Yesterday my Seller closed on the sale of her lovely home located at 3051 Thornbury in Town and Country. The home was on the market for about a year with another agent. I hate to brag, though I took over the listing and sold it in a week! I took new pictures that better highlighted the home, we did a little painting and boom...it sold! I know some of it may have been luck, though I am getting a good track record of being able to sell homes that have lingered on the market. If you are thinking about selling your home in the coming months. Now is the perfect time to meet with me to discuss a marketing plan. Mine- Lower Level office decluttered and painted (Oops I just notice the box in the picture) Also notice that the stained woodwork was painted white. This is a nice MCM home that is in a great location and could be very cool. "This home is a wonderful example of the Burton Duenke/Ralph Fournier collaboration. Beautifully sited on the lot featuring many specimen trees, the Mid-Century Modern aesthetic shines through in both the home's design & site orientation. The oversized & clerestory windows of the "public" portions of the house connect you to the outdoors while the surrounding trees add to the serenity of the bedrooms at the rear of the home. Three bedrooms (one w ensuite bath), 2nd bath, living room, dining room, & kitchen are found on the main level. The LR adjoins the expansive deck increasing the space for gatherings w family & friends. Dbl-sided fireplace betwn the LR & DR will cozy up the chill months. The lower level walks out at grade to the 2-car carport & features an add'l FP, full bath, and several finished rooms--would make an awesome in-law suite! Lots of updates have been done, yet many of the original MCM design features remain including soffit uplighting & wood slab front cabinets." I am proud to say that Dielmann Sotheby's International Realty is currently ranked as #1 in 2015 for the following areas: Downtown, Central West End, University City, Ladue, Parkway North/West/Central, Kirkwood, Brentwood, Clayton, Maplewood-Richmond Heights, Webster Groves, Lafayette and Marquette. The average sale price of our listings was higher and we had an overall higher sales volume compared to any one brokerage firm we got the top spot! Possible Addition to Grand Center Coming Soon? "A $3M building permit was issued late last month for a long awaited rooftop garden atop the Big Brothers Big Sisters building in St. Louis’ Grand Center arts district. The project had be rumored earlier this year, with BSI Constructors being named general contractor. An invitation to bid on components of the project was released by BSI in May. Project images had appeared on the HDA Architects website, but are no longer posted. I think this looks great! The Grand Center is one of the most undervalued areas in St Louis if you ask me. This would be a great addition! Mark your calendars! Saturday, December 5th at 11 A.M.
Scott Perkins, Director of Preservation, Fallingwater, and curator of the exhibition will speak on Samara and Frank Lloyd Wright's Usonian Houses. Reception will follow immediately after the lecture. Admission to this event is free, but reservations are required. In an article recently published by The St Louis Post-Dispatch (article HERE), they discuss a California Investor that is making efforts to rehabilitate many of the crumbling foreclosures in St Louis. So far, Mr. Katsimbrakis has purchased more than 200 homes since 2010. In that amount of time he has managed to rehab and flip around 100 properties, while he has acquired and currently holds about 130 properties. Mr. Katsimbrakis talked about how he has faced multiple hurdles. Many of the vacant properties are often targets of burglary and vandalism. Many of these homes that were being redone had thousands of dollars worth of new wiring, A/C units etc. stolen right from them. But they are taking measures to reduce this, and so far these measures have been relatively effective! This is so important, we need to have more people investing in St Louis. We are always hearing about the bad. But I feel that it is important to highlight the good as well. We have seen much of the success of new construction and rehabs in St Louis City (Benton Park, Tower Grove, CWE, Dogtown, The Hill) and other areas and it has been a tremendous success! In closing, Katsimbrakis said, “Our plan is not to leave the city,” he said. “It doesn’t matter that I live in California.” I love my city, do you? This has always been one of my favorite derelict buildings that I always hoped would be brought back to life ( it had a tree growing out of the roof at one point). I am absolutely thrilled to see it becoming a beautiful, useful space to help educate and spread the beauty of knowledge! You can find the original post, along with a detailed account of the history of this theater HERE. As always, comment what you think, and like+share if you enjoyed the post! 'RANKED: The 50 best suburbs in America' - We have 5 of them! I appreciate everyone who took the time to fill it out! I will go with your suggestions, so start looking for the new content soon! I also addressed a few of the comments! My only suggestion is actually for your actual listings site. The photo gallery is exceedingly frustrating to use. I contacted the company and this is the response I received, "I just told the head developer and he said 'we have another gallery that is easier to use and is not flash being released very soon.'" So thanks for the feedback, a fix is on the way! I'm not seeing your blog posts in my feed on Facebook. On Facebook, go to my page, and click the button that says "Following", then click "See First". Facebook has been rolling out some new algorithms that figure out what to show on your Feed, and it does not always work as expected! If you still need help, send me an email! Whenever you have photos of listings or events, I always wish there were more. I usually try to included 3-5 pictures of the listing, and I always link to the corresponding property website that has a ton of pictures of the properties! I will try to include more photos, but if you can, try clicking the link and let me know if you have any trouble! I will be the first to admit that I usually do only include a few pictures (mostly because they can fill up the front page of the blog), but I will make sure that I am very consistent on making links easier to locate! I think so too!! I will have some fabulous videos to show pretty soon! So keep your eye out! Check out some of my current listings! Last week my Seller closed on the sale of his condo in the ABC or Aberdeen condo building on Kingshighway in the fashionable CWE. We set a record on selling price in the whole complex! Add this to my calendar! Did you know that the Saint Louis Art Museum will be presenting a major exhibition celebrating St. Louis-based architects, artists, and designers, and the significant contributions they made to the midcentury modern aesthetic in America, I had the opportunity to attend a Preview of Saint Louis Modern on Tuesday this week and it was great, I think you will greatly enjoy it! Beginning November 8, explore midcentury modern design up-close and personal at the Saint Louis Art Museum in St. Louis Modern, an exhibition celebrating 30 years of modernism in St. Louis, including significant architectural commissions, public sculpture, murals, and stained glass. Commemorating the 50th anniversary of Eero Saarinen’s modernist masterpiece, the Gateway Arch, the exhibition features more than 150 objects and artworks drawn from the Museum's collection and more than 30 museums and private lenders around the country. Also, don't forget the biggest party of the year. We will be celebrating St. Louis Modern on Saturday December 5th from 7-11pm. The mood is mod for this special evening, which will include classic cocktails and hors d’oeuvres, music, dancing, and plenty of swank and style! For more information and to purchase tickets, visit slam.org/slammodern. Click here to add it to your calandar! Architecturally important homes for sale throughout the world! This is our local St. Louis site. A St. Louis gardener who is a bamboo expert! Read about the latest foodie news going on in town! Mid-century St. Louis and more! A great resource to help you be green. A great resource to keep track of what is going on with St. Louis' historic buildings, neighborhoods and homes.